Deficiency of hepatic enzyme tyrosine aminotransferase characterizes the innate error of autosomal recessive disease Tyrosinemia Type II. Patients may develop neurological and developmental difficulties due to high levels of the amino acid tyrosine in the body. Mechanisms underlying the neurological dysfunction in patients are poorly known. Importantly, Tyrosinemia patients have deficient Omega-3 fatty acids (n-3 PUFA). Here, we investigated the possible neuroprotective effect of the treatment with n-3 PUFA in the alterations caused by chronic administration of L-tyrosine on important parameters of energetic metabolism and oxidative stress in the hippocampus, striatum and cerebral cortex of developing rats. 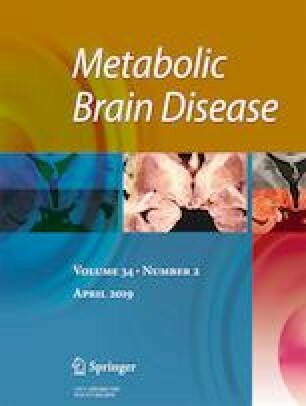 Chronic administration of L-tyrosine causes a decrease in the citrate synthase (CS) activity in the hippocampus and cerebral cortex, as well as in the succinate dehydrogenase (SDH) and isocitrate dehydrogenase (IDH) activities, and an increase in the α-ketoglutarate dehydrogenase activity in the hippocampus. Moreover, in the striatum, L-tyrosine administration caused a decrease in the activities of CS, SDH, creatine kinase, and complexes I, II-III and IV of the mitochondrial respiratory chain. We also observed that the high levels of L-tyrosine are related to oxidative stress in the brain. Notably, supplementation of n-3 PUFA prevented the majority of the modifications caused by the chronic administration of L-tyrosine in the cerebral enzyme activities, as well as ameliorated the oxidative stress in the brain regions of rats. These results indicate a possible neuroprotective and antioxidant role for n-3 PUFA and may represent a new therapeutic approach and potential adjuvant therapy to Tyrosinemia Type II individuals. This research was supported by grants from Conselho Nacional de Desenvolvimento Científico e Tecnológico (CNPq) and Fundação de Amparo à Pesquisa e Inovação do Estado de Santa Catarina (FAPESC).